How do you define an epic? It’s a noun grossly over-used by sportswriters, particularly those who write about cycling. Through the years, European journalists have described heroic deeds by brave athletes on bicycles with gushing prose that was rarely deserved. They even titled road racing’s formative years The Heroic Era. Admittedly, in the long decades before live radio and television commentary brought reality to the grand tours and classics, cycling fans only learned about races through the written word. And journalists depended on selling newspapers to make a living. The better the story, the higher the sales. It’s no wonder they turned ordinary performances into extraordinary feats. On reflection, were the daylong slogs through blinding rainstorms on muddy roads any more heroic than what miners did in their everyday jobs at the coalface? How meaningful was, say, Tour de France contender Eugène Christophe’s carrying his heavy steel bike down the Col du Tourmalet and repairing the forks at a blacksmith’s forge? Or did the survivors of “epic” editions in Paris-Roubaix really deserve the lavish praise heaped upon them by an adoring media? That’s not to say that the riders who excelled in harsh conditions were not deserving of their recognition as exceptional individuals. But a true sports epic is one in which, besides having to battle the elements, the contestants go to the limit of their physical and mental capacities while still competing for the victory in a major competition. All of those ingredients came together on June 5, 1988 on stage 14 of the 1988 Giro d’Italia. That morning, the 7-Eleven team directeur sportif Mike Neel awoke early in Chiesa Valmalenco, heard rain pouring on the roof of his hotel, and instinctively thought: “cold weather gear.” He made all his riders, including team leader Andy Hampsten, grease up with Vaseline. Neel and team manager Jim Ochowicz then worked out a system of getting hot drinks and dry clothes to their racers on the main obstacle of the day, the 8600-foot Passo di Gavia, where reports indicated a foot of fresh snow had fallen overnight. Road crews were still plowing a passage for the race when the peloton began climbing the old mountain pass, mostly on dirt, which the day’s rain was turning to mud. As the road narrowed, and began to steepen with two switchback turns, Dutch rider Johan Van der Velde jumped out of the pack. 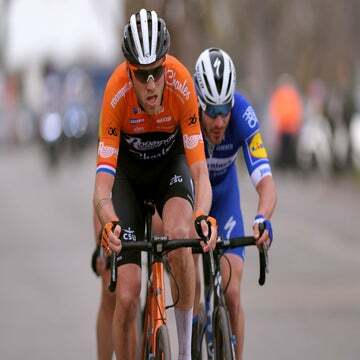 Wearing only an undervest, bib shorts and a short-sleeved purple jersey as the Giro’s points leader, Van der Velde caught an earlier break and quickly pulled away as the tarmac turned to dirt. At the same point Hampsten dashed clear of the diminishing peloton, chased by Dutchman Erik Breukink and Italian Franco Chioccioli, the race leader. Hampsten — who said he prepared for this climb on the dirt roads climbing into the Colorado Rockies from his Boulder home — looked comfortable on the muddy surface, calmly spinning his bottom gear of 39×25. In contrast, an inspired yet seemingly foolhardy Van der Velde was frequently dancing on the pedals, battling heavy rain that turned to snow about 6km from the summit. The wet, heavy snow was being blown into the riders’ faces by a fierce crosswind as they struggled on the frequent sections of 16-percent grade. It was impossible to stay warm. But the bare-armed Van der Velde still rode strongly in the final, paved kilometers of the Gavia. Standing with a French colleague near the mountaintop, I saw Van der Velde emerge through the horizontally driven snow about 30 seconds before Hampsten — who stopped to put on a waterproof jacket and wool balaclava to go with the neoprene gloves he already had on. Breukink overtook Hampsten while he was stopped, but the American soon made up for lost time. The American quickly took command on the long downhill to Bormio, back on dirt roads. “I knew the descent would be the race,” he said. Within a kilometer, Hampsten had passed Van der Velde, who had came to a slow-motion halt, unable to move. Team helpers stripped the tall, gaunt Dutchman of his ice-stiffened clothing and carried him into their team car. After being revived with hot drinks and the car’s heater, Van der Velde eventually continued … and finished the stage almost 47 minutes in arrears. Plowing a lone furrow through the snow-covered mud and rocks, Hampsten was concentrating on survival, not the race, while Breukink gamely followed 20 seconds or so behind — although none of us was quite sure where anyone was in the whiteout conditions. So devastating was the freezing snow that former Giro champions Roberto Visentini and Giuseppe Saronni were reduced to tears of pain. We watched Visentini coasting downhill like a rag doll at a quarter the speed he would normally descend. He stopped three times, once to don a padded ski jacket, another to drink hot tea, and then to have his frozen muscles rubbed back to life. When the snow turned back to rain in the valley Hampsten was brought back to reality by the arrival of police motorcycles and the race’s director’s car. He had another shock when Breukink shot past him about 6km from the finish. The blond Dutchman hung on to win he stage by seven seconds, while Hampsten created history by becoming the first American to don the Giro leader’s pink jersey. 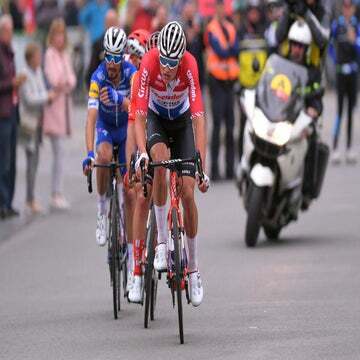 The stage’s third finisher was almost five minutes back; future Tour de France champion Pedro Delgado arrived seven minutes down; and the distressed Visentini lost more than half an hour. The 7-Eleven team’s efforts to get dry clothing to the riders paid off. Besides Hampsten in second on the stage, Bob Roll was 24th, Raúl Alcalá 26th, Dag-Otto Lauritzen 41st and Jeff Pierce 43rd. 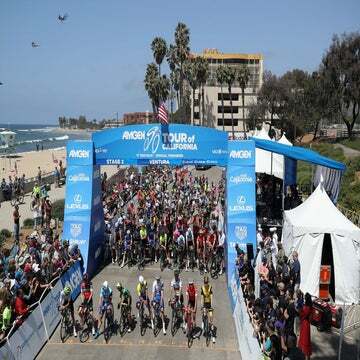 There were 143 finishers, all of them heroes. Despite the team’s precautions, Roll was suffering from hypothermia at the finish, his heart rate a dangerous 27 beats a minute. He was carried into the team car, with an ambulance standing by. But he gradually came around in the warmth of the team’s hotel. Hampsten, too, was shivering when he was awarded the mythic maglia rosa. The emotion was all too much. He returned to his team car and began to sob uncontrollably. It was an epic the likes of which we’ll probably never witness again.